The one step in my skin care routine that I'll invest the most time is my cleansing routine. Cleansing routine is the most basic yet essential step in your skin care routine. One sturdy cleansing routine can substantially enhance your skin texture and make it glow. 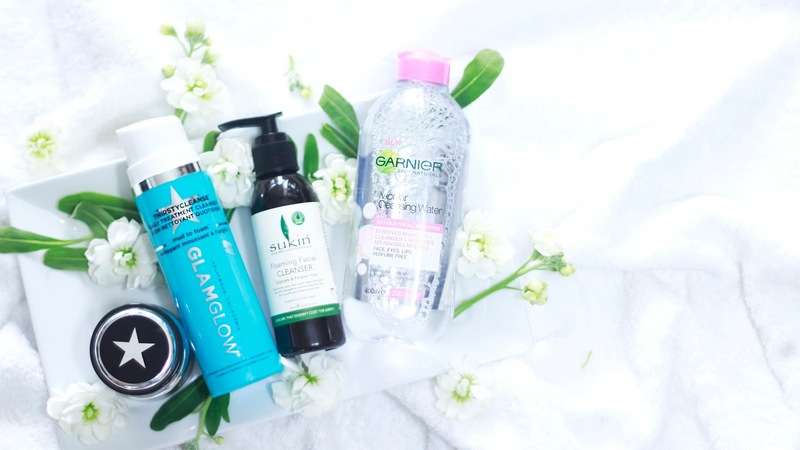 Check out my current cleansing gears I can't live without! but this was my first time experiencing a cleansing water that actually soothes and hydrates your skin at the same time. Garnier Micellar Cleansing Water is one of the most gentlest cleansing water which is designed for sensitive skin and makes it beloved by all different skin types. This product effectively removes your face makeup with two sheets of cotton pads. I recommend you to also incorporate using Garnier Eye Makeup Remover! Then I move on to rinsing away any makeup residues by using cleansing oil or a cream. I've been using it as an replacement for any cleansing oils. but it easily turns into a foaming lather. while leaving my skin feeling deeply moisturized. Now you might be freaked out with the amount of cleansing products I use at once. YES, I do finish off with another cleanser! and keep the skin soft, clean, and moisturized. and I really fell in love with its product that I want to try more from their range! After I finish my entire cleansing routine, I follow up by exfoliating my skin once or twice a week. This Glamglow Youthmud is a wash off clay mask designed to provide gentle resurfacing exfoliation. I wasn't really wowed by this product until I actually had really bad skin rashes once. but nothing seemed to work but this guy. After 10 minutes of application, my skin was a lot smoother, brighter and softer. Also the rashes were pretty much gone the following morning. Ever since, I've been only reaching this product whenever I experience a weird skin day. So this product is not only exfoliating but also wonderful at soothing and cooling down your skin! Hi there!! I love all your recommendations cos they r so perfect for my skin type. I have just started to catch up with Korean skincare routine, could u pls also help me with a toner which u use?